During May 2009, salvage excavations were conducted at the old police compound (the Qishle) by the Clock Tower Square in Yafo (Permit No. A-5651; map ref. NIG 177056–154/662605–667; OIG 127056–154/162605–667). 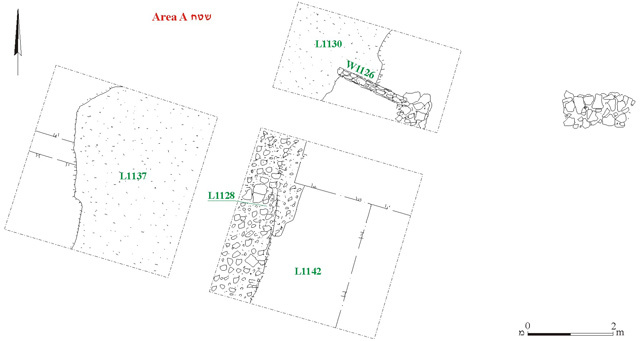 The excavations, undertaken on behalf of the Israel Antiquities Authority and underwritten by the Orchidea Hotel Group, were directed by Y. Arbel, with the assistance of L. Talmi and D. Golan (area supervision), S. Ya‘aqov-Jam and E. Bachar (administration), A. Hajian (surveying), A. Peretz (field photography), A. de Vincenz (ceramics consultation), R. Kool (numismatics) and K. Rafael (metal finds). 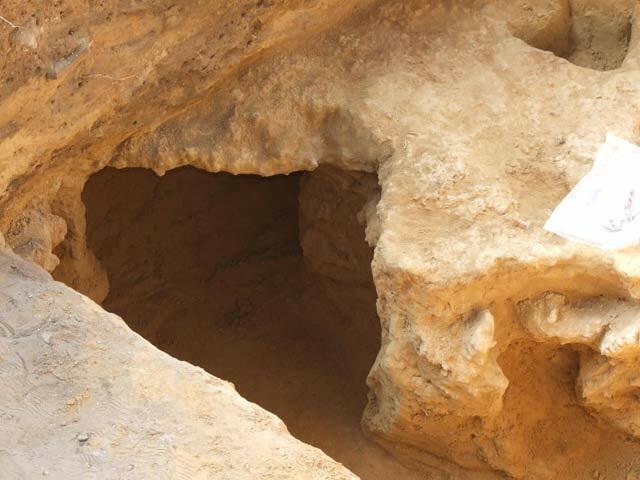 The excavation completed the major project conducted at the site in 2007 (HA-ESI 121; Fig. 1), focusing on two limited segments, which could not be reached before due to technical reasons. 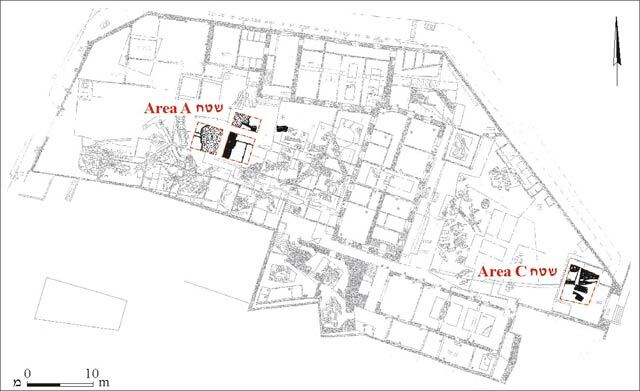 One segment (Area C) comprised a single square (6 × 7 m) located at the eastern extremity of the compound, which had previously been occupied by the police front desk (Fig. 2). The second segment (Area A) consisted of two squares and an additional half square at the center of the compound’s western courtyard (Fig. 3). Architectural remains were found only at Area C, over an unrelated layer of graves. Both layers dated to the nineteenth century CE. Large quantities of fill, deposited during the later decades of the same century, were discerned in Area A, with no related architecture. The excavation reached kurkar bedrock, overlain with Hellenistic potsherds. Hollows in the rock were investigated as well, but no traces of anthropogenic activity were detected. Area C. Immediately below the concrete foundations of the police compound, earlier walls built of roughly cut kurkar stones and consolidated with cement-plaster, had emerged, as well as a corresponding plaster floor (L525; Fig. 4) between them.Three walls (width c. 0.5 m) of this structure were partly exposed, including two long walls (W522, W529) and a perpendicular wall between them (W528). The general orientation of construction was southwest-northeast, deviating from that of the main buildings in the Qishle compound. 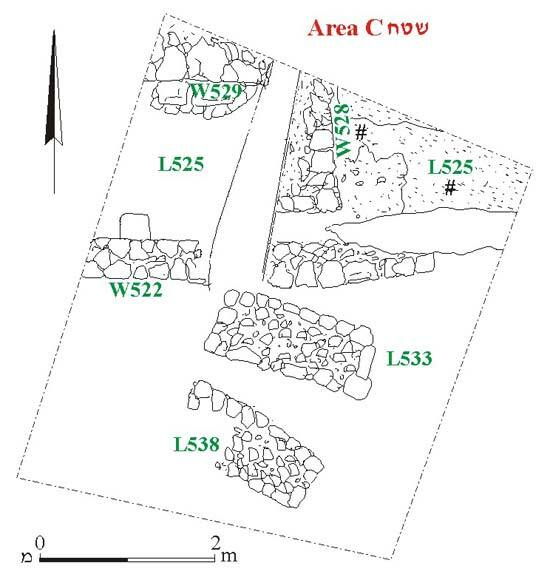 The northeastern W529 was exposed for only 1.25 m and remained mostly buried in the section; the southwestern W522 could be followed to a length of 4.45 m and the connecting wall (W528) was 1.1 m long. The inner faces of these walls were coated with a layer of plaster (thickness 3 cm). Although the walls were poorly preserved and survived a single course high, they seem to have belonged to a reasonably well-built unit. Related pottery, metals, glass and coins dated to the late Ottoman period (nineteenth–early twentieth centuries CE). 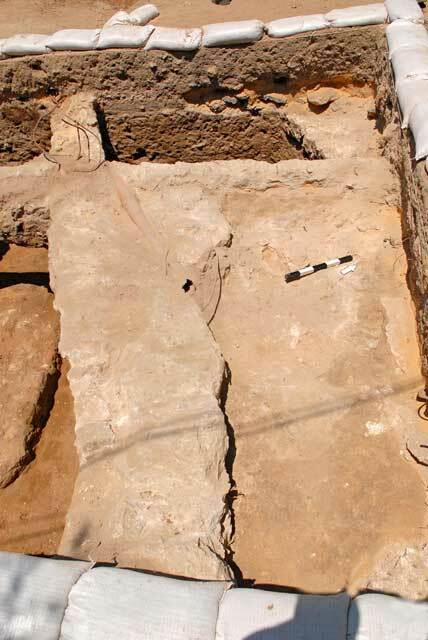 A layer of fill (thickness 1 m) separated the structure from seven burials discovered in various parts of the square. Five of the graves, which consisted of underground beach-rock slabs deposited over the human remains, were in the sections (Fig. 5).The remaining two graves in the center of the area (L533, L538) showed unusual preservation. The burials at the Qishle, as those in the Clock Tower square and adjoining areas to the north and east, were destroyed in the early twentieth century, reportedly by the Ottoman governor Hasan Bey. The destruction apparently obliterated most of the superstructure, which in traditional Muslim funerary architecture, consisted of one or two stone markers set into a rectangular platform. The human remains and their covering slabs were in many cases left more or less undamaged. 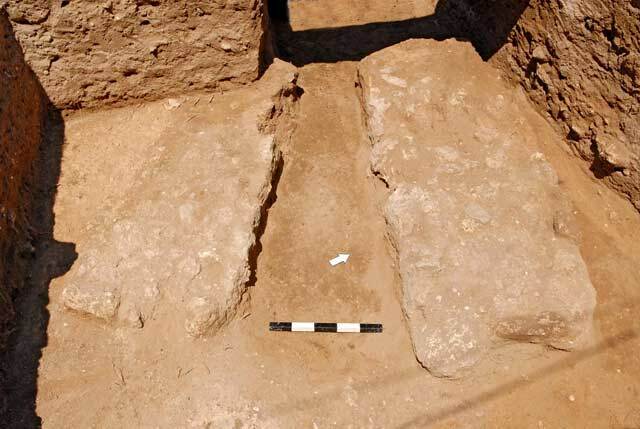 The bases of the superstructure platforms in the two graves had, however, remained intact and are, so far, the only such example in the compound's excavations (Fig. 6). Area A. The excavation was obstructed by the remains of concrete foundations, mainly in the half square that marked the northern limit of the area. These remains (W1126) probably belonged to a structure of British Mandate origin. Many such structures were built on this part of the site, as well as numerous Israeli additions of mostly lighter prefabricated materials. Below the modern level was a fill layer (thickness 0.9 m), which overlaid a solid surface of packed earth and plaster (L1130, L1137; Fig. 7) and contained late Ottoman ceramics, glass and metal artifacts, as well as several coins. Fill of a similar nature that contained analogous finds was excavated below the solid surface. 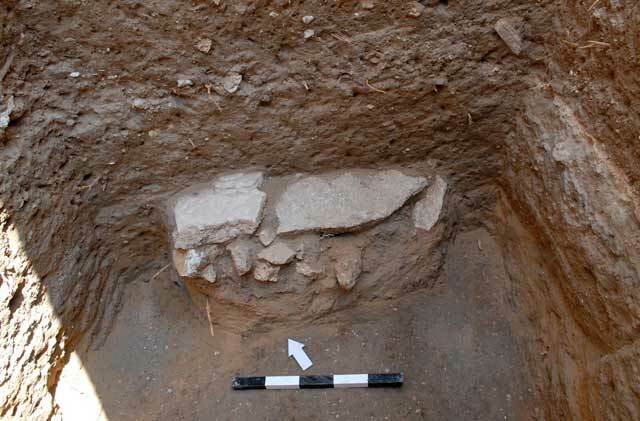 An exactly matching stratigraphy was discovered throughout the central and western parts of the western courtyard in 2007 (HA-ESI 121). Pottery and other finds in the thick fill above and below the solid surface (L1130) dated to the late Ottoman period. Hence, the solid surface was probably a foundation bed for the Qishle’s actual surface, paved c. 1 m higher. The purpose of the solid surface may have been to stabilize the thick, but relatively soft fill that was intended to level the ground in preparation for the construction of the Qishle compound in the 1880s. The kurkar bedrock, exposed 3.1 m below surface (L1142), was overlain with a sandy layer that contained potsherds from the Hellenistic period. A similar layer, overlaying bedrock, was found in 2007 immediately to the north of the present excavation. No architectural remains could be securely associated with this period during the former excavations at the western back courtyard and none emerged in the course of the present fieldwork. Exposure of bedrock brought to light what seemed at first as an artificially hewn space, with an apparent straight-angled entrance (Fig. 8). However, excavating the space yielded sterile sand and rock fragments with no anthropogenic materials of any kind. The easily fractured nature of the kurkar rock could have obscured any marks of hewing tools. However, the complete absence of finds and the likelihood that natural elements caused erosion and damage to the soft material, suggest that the space was natural. The results of the current excavation at the Qishle compound are directly associated with those of the 2007 excavation in the corresponding areas. The structure in Area C indicates obscure limited activity during the brief period between the cessation of funerary utilization and the construction of the Qishle complex. The graves discovered in Area C were of the same type as those uncovered c. 10 m to the west in the same part of the compound. The innovation of the latest discovery was in two aspects. The first was in the physical connection that now existed between the graves at the Qishle and the large historical burial ground to the north of the city. The second was the discovery of some of the graves’ superstructures. The discoveries in Area A fill in a localized hollow space in the plan of that part of the compound. 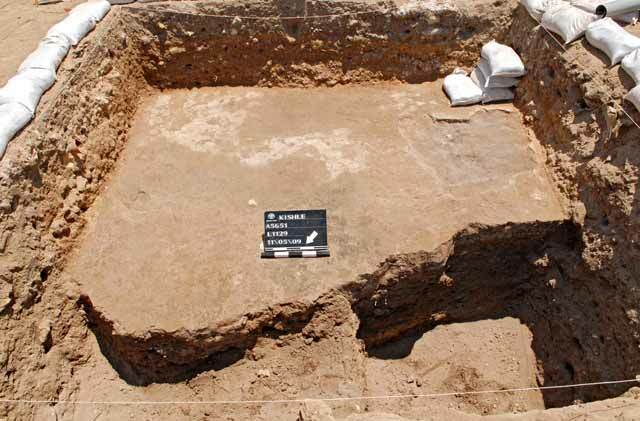 The absence of graves in the excavated area, and the discovery of the Ottoman surface's foundation bed helps define the western limits of the burial ground, as well as the gradual decline of the natural topography that was filled in prior to the construction of the Qishle compound. The completion excavation thus added valuable details to the general framework gained during the main phase of investigation in 2007. 4. Area C, remains of a late Ottoman structure at the Qishle eastern yard, looking northwest. 5. Area C, beach-rocks slabs sealing a nineteenth-century grave, looking northwest. 6. Area C, base of two Muslim grave platforms, looking west. 7. Area A, the packed earth and plaster layer at the western yard, looking southeast. 8. The spaces in the kurkar bedrock.